Working with seasonal ingredients, chef Julia Busuttil Nishimura slows down to create dishes with purpose. Julia Busuttil Nishimura has turned cooking into a ritual – and now, a book. Ostro is her collection of simple, seasonal recipes, influenced by cuisines and stories from around the world. What cooking skills are you still working on? I'm still working on getting the perfect sourdough loaf! There are so many variables when baking bread, such as the air temperature, type of flour and proofing time and I'm trying to get my loaves more consistent. Sometimes they're perfect, sometimes not so much. It's a very delicious science experiment. What has been the most difficult skill to master? I think making really good gnocchi – the results depend heavily on the potato, and each one is different so the journey is to work out for yourself how the dough should feel. That's not an easy thing to figure out and an even harder thing to communicate in a recipe. Right now I'm learning a lot about Japanese food from my husband. At the moment he's teaching me how to make different noodles from scratch. I also took a class in wagashi (Japanese sweets) in Kyoto recently and it was truly amazing. My husband, Nori, and I wake up at around 6am with our son, Haruki. I stay in bed for a little longer, check my emails and make a list for the day, while Nori and Haruki begin to make breakfast. We rotate between sourdough toast, porridge or a traditional Japanese breakfast. Because we wake up quite early, we're not usually in a hurry and spend quite a long time sitting around the table, eating and drinking many cups of tea and coffee. What are your weekend family rituals? We usually go to the market early in the morning on a Saturday and spend a few hours there – shopping for ingredients, having a coffee and browsing in bookshops. It's one of my favourite moments in the week, and where I draw a lot of inspiration from. What rituals are you creating with your son? I love cooking with Haruki. Even though he's still so little, he loves helping to roll out pasta dough with me and tumble ingredients into bowls. It's incredibly messy, but it is really so much fun. He's by my side, standing on a stool, while I prepare most dinners at home. I think it's key to have children learning about food from an early age. Cooking and eating can so often be hurried moments in the day. While there are certainly days when time is scarce, usually mealtimes anchor us as a family and fill our home. Small acts – like stirring the polenta on the stove or kneading dough – are all moments of mindfulness and a chance to slow down and spend time together in the kitchen. By continuing to cook the food my parents and grandparents cooked, it keeps something really special alive. They never documented the recipes so it is really important to me to write them down along with their stories. When I cook, I am often transported back to that moment when I learned how to make the food, or when I tasted it for the first time. It's a plate of food, but it signifies so much more. I love writing and sharing recipes, but I think what I enjoy the most is seeing people take my food and put their spin on it. I want people to use my recipes as a guide, rather than as a strict set of rules. I often offer suggestions for substitutions, whether it’s dependent on seasonal availability or access to tools and ingredients. Ostro: The Pleasure That Comes From Slowing Down and Cooking with Simple Ingredients by Julia Busuttil Nishimura is available now, published by Plum, RRP $44.99. Julia Busuttil Nishimura makes good food with simple ingredients. 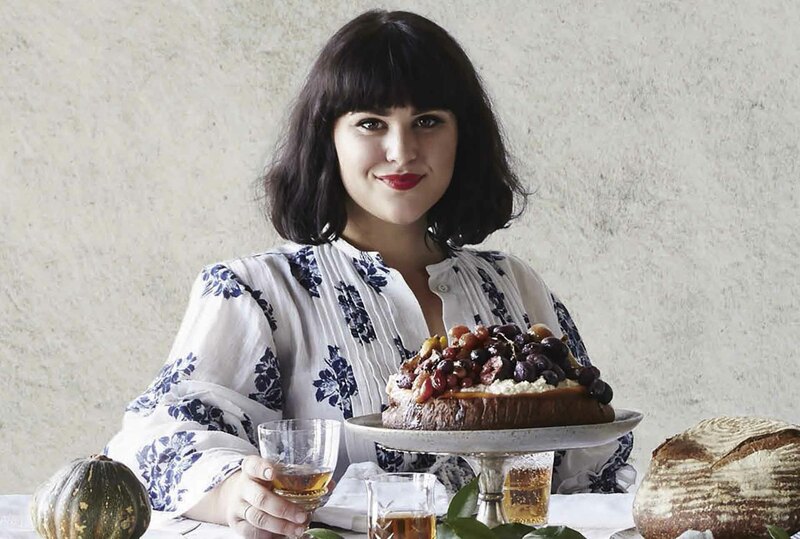 Her first cookbook, Ostro is out now.